3 DVDs · 5 hrs. 3 mins. BECOMING A NATURALIZED U.S. CITIZEN! Becoming a naturalized United States citizen just became a whole lot easier — thanks to the experts at Video Aided Instruction! 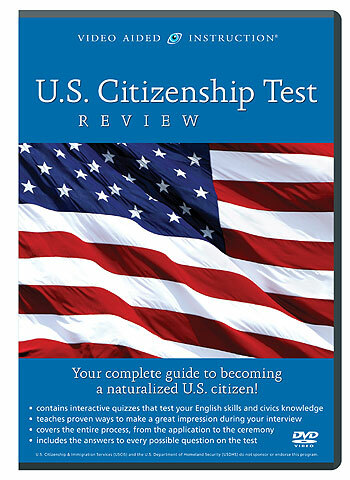 With this brand new, comprehensive course, prospective citizens can review all of the reading, writing, and civics test questions that they might have to answer during their official USCIS interview. In addition, applicants will receive step-by-step guidance through the entire naturalization process, from understanding who’s eligible to apply to understanding the rights and responsibilities of American citizens, from getting fingerprinted to submitting an application, from staying relaxed and making a great impression during the interview to eventually taking the Oath of Allegiance during the naturalization ceremony. Best of all, this unique program features interactive quizzes designed to simulate the real experience — so viewers can “test themselves” again and again as they work toward mastering English, memorizing all the civics facts, and perfecting their interview skills! Millions of people wish they could become full-fledged naturalized citizens of the United States of America. This one-of-a-kind DVD set from Video Aided Instruction can help them fulfill their dreams.